Summary: Three romantic rivals. One crowded house. Plenty of room for jealousy. 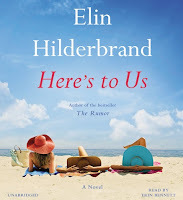 Every summer, I look forward to reading Elin Hilderbrand's new beach book! This summer it was titled HERE'S TO US, and I received an audio copy for review. I am the first to admit that I tend to read books more quickly in print form; however, this audio book took me an especially long time to read. I think my summer schedule (or lack thereof) was one of the reasons, but I also didn't really enjoy this Hilderbrand book like I normally do. HERE'S TO US reads a little bit like The Real Housewives of Nantucket or maybe I should say The Real Ex-Wives of Deacon Thorpe. Deacon Thorpe was a famous chef and restaurant owner who had his fair share of demons including drugs, alcohol and women. Ironically enough, he died unexpectedly after he came clean! A few weeks after his death, his two ex-wives and current estranged wife as well as his children all arrive at Deacon's Nantucket beach house to celebrate the man's life. It probably shouldn't surprise you that Deacon's ex's don't get along... at all... and that's putting it mildly. There's Laurel, his first wife and high school sweetheart, who continued to "keep in touch" with Deacon even after he left her for Belinda, an Oscar winning actress. Belinda is everything you'd think (if you think the worst) about a Hollywood actress. She was incredibly selfish and vain and bitter about her divorce from Deacon. And then there was Scarlett, a young Southern girl who was Belinda and Deacon's nanny. It was obvious that there would be plenty of opportunity for drama with these three women and their kids living in a small beach house. When the three women all arrive at Deacon's favorite place in the world, they learn from Deacon's best friend (and business manager) that the cottage is willed to all three of them! If that's not bad enough, the house is in foreclosure and they need to come up with a ton of money if they want to save it. As the family remembers Deacon's life (both the good and the bad), many secrets are brought to light that could forever change the way these women look at their lives... and the meaning of family. I really wanted to like HERE'S TO US, but it just didn't work for me. I thought the premise sounded fun, especially for a beach book; and maybe it would have been if I had read it in a day or two while lying by the beach. However, I listened to it while I walked and ran; and it just wasn't intriguing enough for me to make an effort to come back to it. Evidently, it's me though. The novel has four stars on Amazon, so I have a feeling that this book just didn't resonate with me for some reason. I don't want to bash this novel just because it didn't work for me, but I do want to give you a reason or two why I didn't enjoy this book as much as some of Ms. Hilderbrand's books. If I had to sum it up in one word, I'd say "characters." I just didn't like many of them, and I actually couldn't stand quite a few of them. Now I know I don't have to like the characters to appreciate a book, but this was more extreme. The pettiness and selfishness of the characters was over-the-top -- just too much and too stereotypical. Having said that, a few of the characters did show growth in the story; and I appreciated that. It was just a long way for me to get to that point. Ultimately, I liked how things worked out for most of the characters, but I will say it was fairly predictable. I still think that's okay because a book like this (i.e. a breezy beach book) because that's what readers expect; however, I did feel as if the ending of the book had a much quicker pace than the rest of the story. One thing many readers will enjoy is the vivid descriptions that Ms. Hilderbrand uses to describe her characters and the setting. She does a great job in detailing the characters' appearances and clothes and an even better job of bringing the town Nantucket to life. And as far as food goes, this book will keep foodie readers very happy. She does a wonderful job of describing some decadent dishes and even includes a few recipes! I actually listened to HERE'S TO US rather than reading it, and it might have made a difference in my appreciation of the story. That's not a knock against the narrator Erin Bennett because I thought she did a fine job. Rather, I'm just not a huge fan of listening to books unless they knock me off of my feet! 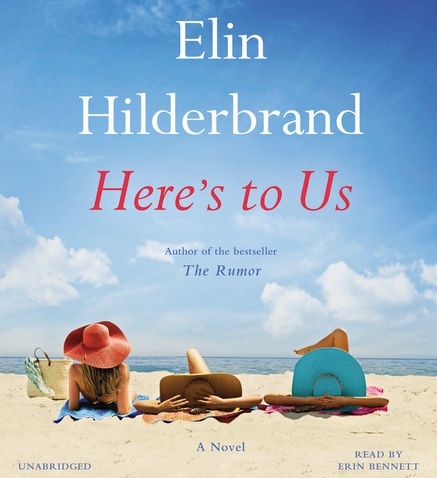 Overall, HERE'S TO US was not my favorite of Ms. Hilderbrand's novels; however, I do think her loyal fans will enjoy the story. You're right - this might be better in print - but her books are hit or miss for me lately. I tried to read this one but after several chapters I gave up - I didn't enjoy it at all (and I usually like her books).